The teaser trailer for the next book in Jessica Shirvington’s Embrace series is here! 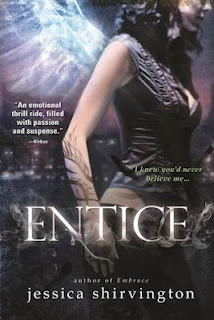 In Entice, the war between Exiles and Angels is on—and Violet Eden is wanted by both sides. Living a secret life as a warrior protecting innocent human lives isn’t easy. Knowing who to trust is key, but when Grigori reinforcements arrive, it becomes clear everyone is hiding something. Even her partner, Lincoln. And with Phoenix more dangerous than ever, Violet is truly on her own. Next month, fans of the series will be able to meet up for an 8-day Entice Me Day celebration. Meet the characters, catch the reveal of the full book trailer and join Sourcebooks for the big party on September 15th where you'll get sneak peeks and have the chance to win prizes.